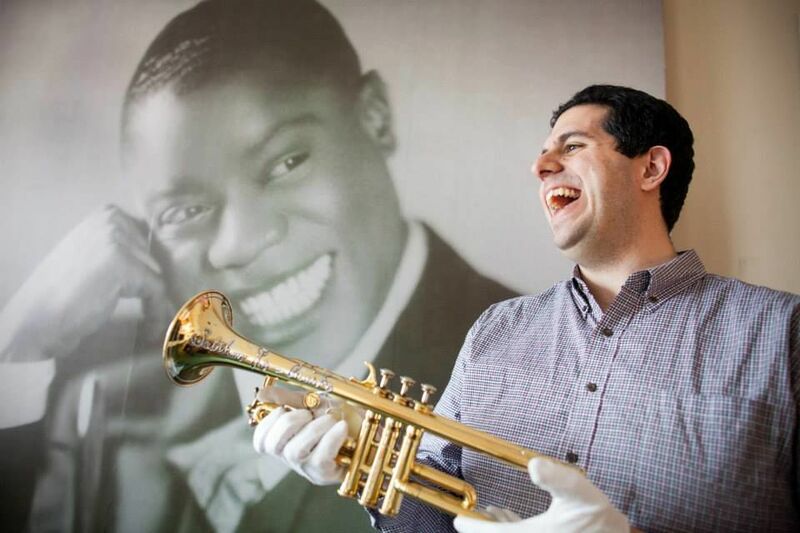 Ricky Riccardi, director of research collections for the Louis Armstrong House Museum in New York, will present rare film footage of the jazz legend during Satchmo SummerFest. Louis Armstrong plays in his den. Ricky Riccardi is making his 10th annual pilgrimage to Satchmo SummerFest. And as always, he comes bearing gifts. Friday, Saturday and Sunday at the Satchmo Legacy Stage in the New Orleans Jazz Museum, Riccardi, director of research collections for the Louis Armstrong House Museum in New York, will present rare film footage of Louis Armstrong — arguably New Orleans’ most famous musician. Riccardi’s other SummerFest programs include a Sunday preview of the nearly completed, 100 percent digitalization of the Armstrong House Museum’s vast collections. A $2.7 million grant from the Fund II Foundation made the conversion possible. Riccardi’s debut at Satchmo SummerFest in 2008 helped make his career as an Armstrong archivist possible. At the time, despite his master’s degree in jazz history research from Rutgers University, he worked full-time as a house painter. In his spare time, Riccardi was seeking a publisher for his book about Armstrong and writing a blog about the beloved jazz great. Jazz fans, writers and scholars eventually found Riccardi’s Armstrong blog. One of them, Jon Pult, invited the young scholar to lecture at Satchmo SummerFest. At the 2008 Satchmo SummerFest, the overwhelmed Riccardi found himself in the company of Morgenstern, Armstrong biographer Gary Giddins, Armstrong record producer George Avakian and Michael Cogswell, his future boss at the Armstrong House Museum. Shortly after the festival, Riccardi signed a deal with Pantheon Books for his Armstrong biography, “What a Wonderful World: The Magic of Louis Armstrong's Later Years.” By October 2009, he was working for the Armstrong House Museum. Riccardi’s first brush with Armstrong came with he was 15. Already a fan of the Preservation Hall Jazz Band, he saw Armstrong’s cameo appearance in “The Glenn Miller Story,” the James Stewart-starring biopic about the big band leader. Armstrong wasn’t always as esteemed as he is now. During the civil rights era, many saw him as more entertainer than the artist, innovator and jazz giant he is. Riccardi credits Wynton Marsalis, another trumpeter from New Orleans, with helping change that perception in the 1980s. Gary Giddins’ 1988 Armstrong biography, “Satchmo: The Genius of Louis Armstrong,” and its companion documentary cast more light upon Armstrong’s importance. In addition to Armstrong’s musical prowess, the embracing presence he projects on record and film keeps him relevant, Riccardi said.